Using the latest 3D scanning technology, Alexander Armstrong and Dr. Michael Scott uncover the hidden history of Italian civilization and city life. This three-part series airs on Rhode Island PBS on consecutive Mondays starting February 11 at 9 p.m. The same episode repeats on Thursdays at 9 p.m.
(February 11 and 14) Using the latest 3D technology, Alexander Armstrong and Dr Michael Scott uncover the hidden history in Naples from its earliest Greek and Roman origins. They explore how the volcano of Mount Vesuvius both nurtured the region and exacted a terrible price on the local population. They also delve into a labyrinth of fascinating underground spaces that helped build and sustain the city. 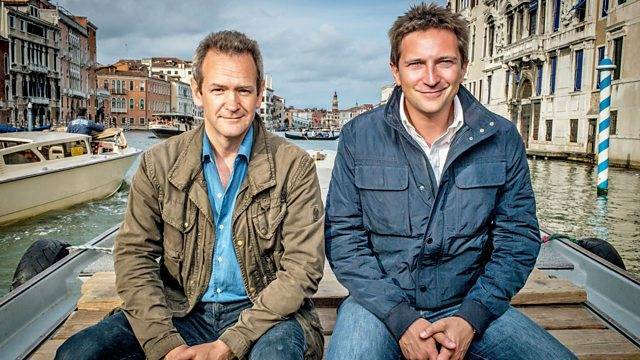 (February 18 and 21) In this episode, Alexander Armstrong and Dr Michael Scott explore the watery wonderland of Venice. They uncover how a city built in a swamp became one of the most powerful in medieval Europe and dive into its canals to experience how the city remains standing. Plus, they reveal how the city's beauty once masked a ruthless secret state and a world of excess and vice. (February 25 and 28) In the final episode, Alexander Armstrong and Dr Michael Scott explore the romantic city of Florence. They reveal how its wonderful facades and artworks mask a hidden story of intrigue and secrecy, and one powerful dynasty was behind it all - the Medicis, godfathers of the Renaissance. Finally, the scanning team build a virtual reality 3D model to reveal how the city's secret corridors of power were the foundation of its Renaissance glory. WSBE Rhode Island PBS transmits high-definition (HD) programming over the air on digital 36.1; on RI cable: Cox 08 / 1008HD, Verizon FiOS 08 / 508HD, and Full Channel 08; on MA cable: Comcast 819HD and Verizon FiOS 18 / 518HD; on satellite: DirecTV 36, Dish Network 36.